The Fennimore Doll & Toy Museum, located 1135 6th Street, Fennimore WI, showcases classic and collectible dolls and toys from around the world. Established in 1991, the museum features heirlooms owned by or on loan to the museum. Under the management of the Friends of the Doll and Toy Museum, the museum continues to add new collections, offer unique and exciting displays, and welcome visitors from near and far. See the Featured Exhibits page for slideshows, descriptions and more information. Continuing displays in the museum include exhibits of classic, antique and collectible dolls and toys range from the 1800's through 2000's. The displays include porcelain, china, paper maché, metal, composition, vinyls, and plastic dolls as well as dolls made of many other materials. Coupled with period accessories, the displays tell their stories. Be sure to see our specially constructed display with 740 Barbies® and accessories. 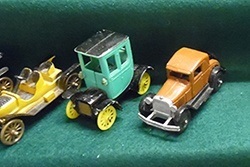 The toys range from an exceptional cast iron collection from the 1890s - 1920s, old farm machinery of the 1920s - 1940s, tin toys of the 1930s - 1950s, to classic Fisher Price® pull toys. Along with these are tops, Ninja Turtles®, Masters of the Universe®, Star Wars®, Disney® characters, super heroes and many more. Our greatly enhanced 1950s Western collection is a welcome addition. Groups are welcome and tours of both the Doll & Toy Museum and the Fennimore Railroad Museum can be coordinated with one phone call. At the Doll Museum, educational programs are adjusted for the age of the students. Learn how toys and dolls have evolved and compare toys from the past with those of today. At the Railroad and Historical Museum, climb aboard an old train engine, ride the narrow-gauge train and view the antique farm equipment and household items. On-site bus parking and loading. Both buildings are handicap accessible and air conditioned. Call 608-822-4100 or email dolltoy@fennimore.com to schedule your group tour. 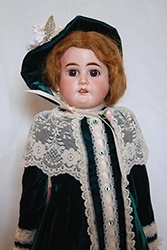 Operated by the Friends of the Fennimore Doll & Toy Museum, the museum operates as a non-profit organization and runs completely on volunteer help, donations, and a modest entrance fee. The museum has many wonderful volunteers but it needs the support of new volunteers to work at the museum and welcomes all financial contributions. Located at 1135 6th Street, Fennimore, WI, the museum is directly behind Subway and across the street from the Fennimore Railroad Museum. See the City of Fennimore WI website for local amenities and events. Please call for updates or information 608-822-4100 or email dolltoy@fennimore.com. Let your heritage not be lost, but bequeath it as a memory, a treasure, and a blessing, and preserve it for your children.